Russia’s Ob River flows from south to north, and each summer, it thaws in the same direction. The result is that an ice jam sits downstream from thawed portions of the river, which is laden with heavy runoff from melted snow. On June 29, 2007, the Moderate Resolution Imaging Spectroradiometer (MODIS) flying on NASA’s Terra satellite captured this image of the almost completely thawed Ob River. The scene is typical for early summer. South of the ice jam, the Gulf of Ob is swollen with pent-up run-off, and upstream from that, the river is widened as well. Unable to carve through frozen land, the river has little choice but to overflow its banks. Besides the annual overflow, this image captures other circumstances of early summer. 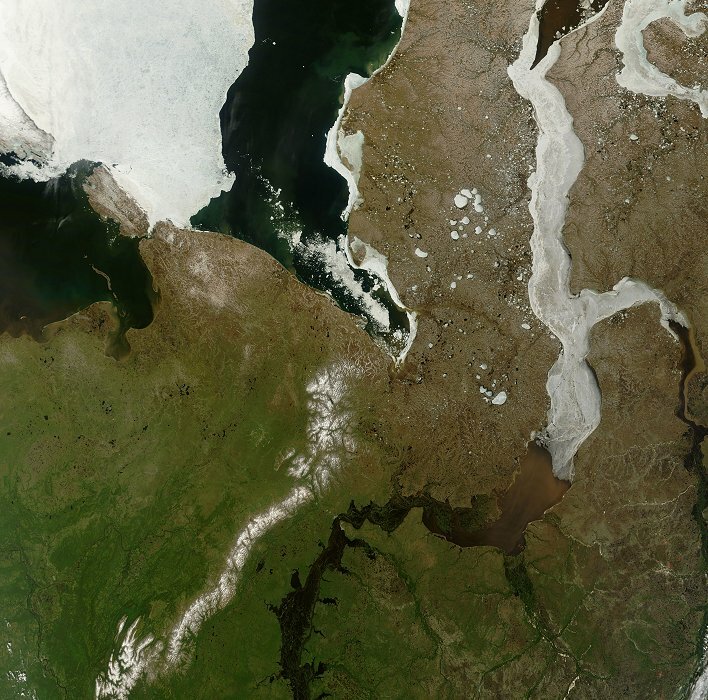 Sea ice is retreating from the Kara Sea. A lingering line of snow cover snakes its way along the Ob River, to the west. And while the land is lush and green in the south, it appears barren and brown in the north. 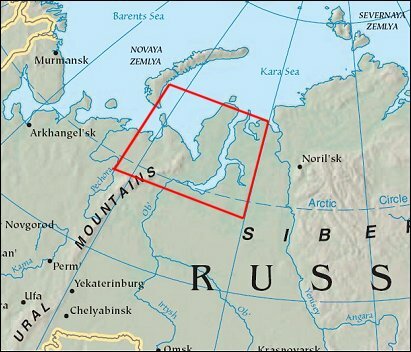 Near the mouth of the river and the Kara Sea, the land is cold-adapted tundra, with diminutive plants and a short growing season. Just as the ice plugging the river had yet to thaw in the Far North’s short summer, the tundra had not yet to greened up either. In this image it still appears lifeless beige.